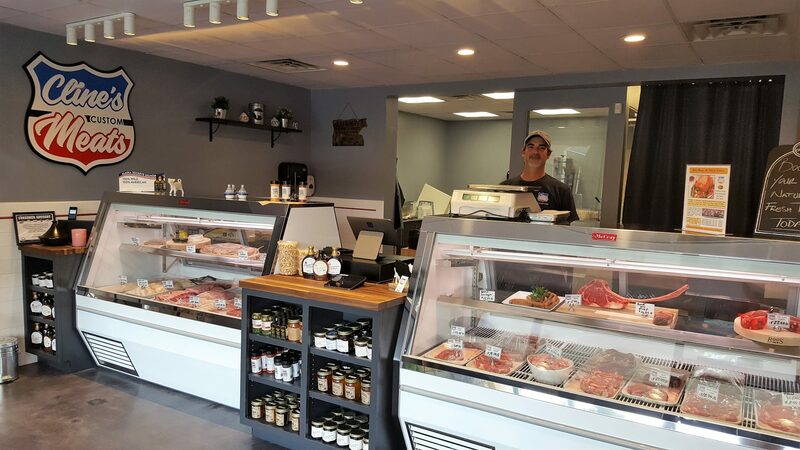 In a time where the world is gravitating toward the familiar, the nostalgic, and the old is new again, Cline’s Custom Meats could not have opened at a better time. This family owned Butcher Shop is located on Hendricks Avenue in the old La Nopalera building. After opening its doors for the first time on August 20th, walking through those doors feels like you’re stepping back into the past. With a clean and sleek appeal, it harkens back to a time where you knew your butcher by name. Joseph Cline and his wife Milouda are the perfect pair. 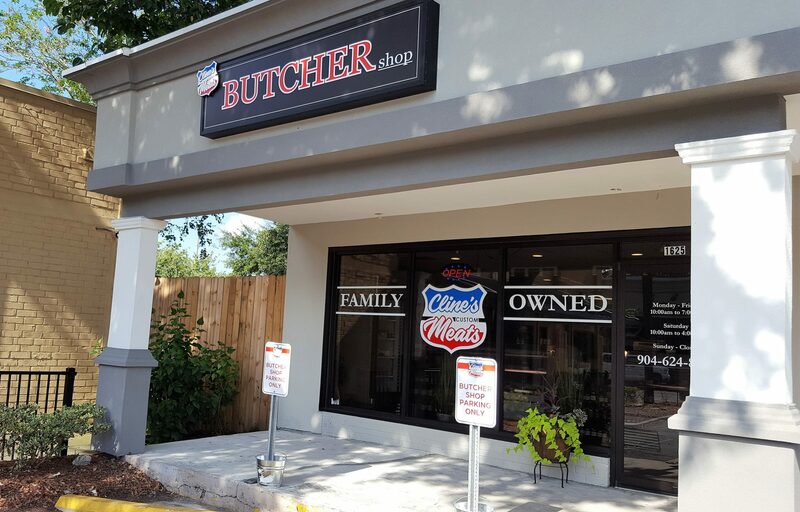 Butchering is literally in the Cline’s blood, spanning years of the craft and bringing their heritage to the forefront of their new shop. Joe’s great-grandfather was a fisherman in New York and Milouda’s father owned his own butcher shop in Morocco. 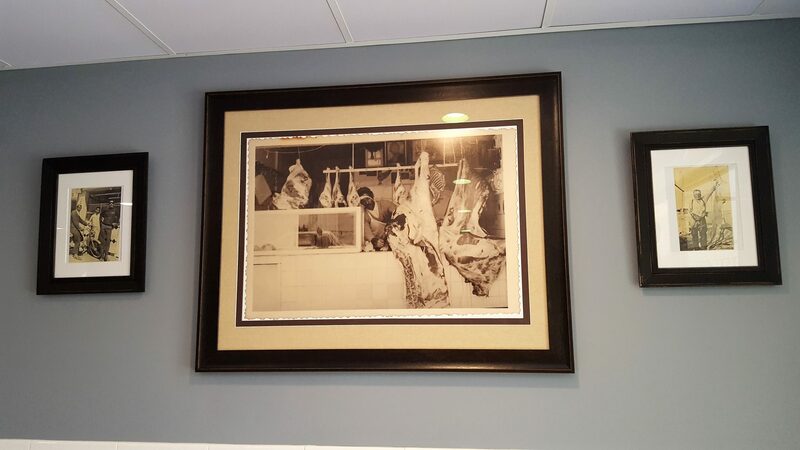 A black and white picture of her father’s butcher shop is proudly displayed right when you walk in to Cline’s Custom Meats. Her brother still lives in Morocco as a butcher and cattle farmer as well. Both have a rich history and ties to the San Marco area. Joe was born and raised in Florida, working hard in numerous different aspects of the hospitality business. Starting at the bottom as a busser, he worked his way up as a receiving clerk, where he first caught the interest of butchering. Working closely with chefs, he honed his craft until he became kitchen manager. After a stint in the Military he started work at Grand Western Steaks in Ft. Lauderdale. For the past seven years he has been a Food Purveyor for Halpern’s, selling meat to the big companies. His wife Milouda was born and raised in Morocco, moving to America fifteen years ago. Working at some of San Marco’s leading restaurants like Bistro Aix and Taverna, she has built a strong reputation as a local favorite and familiar face. 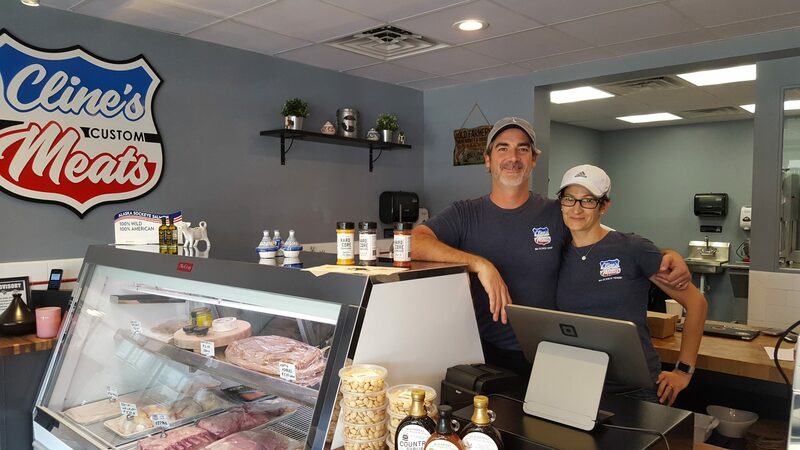 Joe and Milouda had been mulling over an idea to open a butcher shop for more than two years before they took the leap and made their dreams a reality. As a food rep Joe saw first-hand that many restaurants and companies essentially have a middle man and lose that intimacy of knowing where their products come from. They recognized San Marco was underserviced when it came to food—not restaurants per se—but proteins and produce; there isn’t a grocery store for miles. The Clines want to focus on getting to know their neighbors and knew San Marco was an up and coming area and would be a seamless fit. All the stars aligned, and in nine short months their dreams came to fruition. When you walk in the doors of Cline’s Custom Meats you are met with a smile by Joe and Milouda themselves. Two beautifully lit display cases greet you and exhibit their large variety of different cuts. You feel like you traveled back to the 1960s with crisp white subway tiles lining the lower half and slate gray wall reaching the ceiling. In the far left corner, a separate cooler is a hidden gem with a barrage of specialty items like foie gras, local cheeses, olives and caviar. A small display of vegetables is also offered to pair with any protein you may buy, to make a complete meal. Now on to the real meat of the article! (Pun intended.) There is no shortage of impressive cuts at Cline’s Custom Meats; it’s literally in their name. 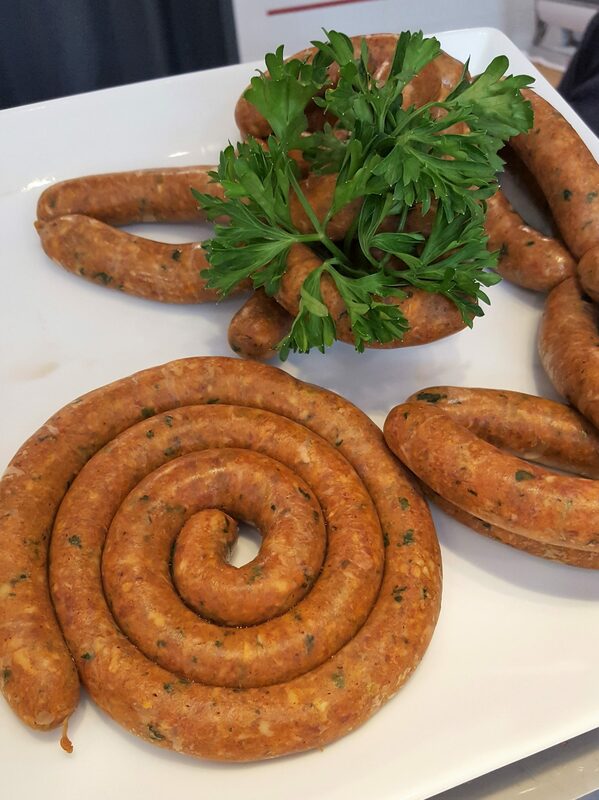 Their displays showcase favorites like in house ground beef ($5.99/lb), Tomahawk–a serious show stopper at $18.99/lb, and homemade sausage crafted by Milouda herself! Keeping her heritage close to her heart (and stomach) she mixes Moroccan flavors like Harrisa and Ras El Hanout into meatballs and kebobs. She hopes to sell her special blend of spices soon. The big sellers may surprise you too. Dry Age Prime Strip ($29/lb), Boneless Ribeye, Top Sirloin, Beef Ribs are all pretty common choices in any good shop, but Joe surprised me by offering Spinalis and Wagyu Tri-Tip. Spinalis is growing in popularity and lucky for us becoming readily available. Just another fancy term for Ribeye Cap, Spinalis is the sweet spot of muscle trimmed off the ribeye steak, about 16” long 8” wide and 1” thick. It may be the most buttery, rich, tender piece of meat you ever put in your mouth. Move over filet and go back home to 1995! The Wagyu Tri-Tip is also gaining in popularity in the United States. This perfect two pound triangle of beef is where the sirloin meets the round and flank, and makes its way into the top of my list. With superb marbling it lends itself to being juicy and tender with hints of umami. Just make sure not to overcook it, as it is a leaner cut of meat with no fat caps. Joe sources his beef from Colorado and Nebraska, where the consistency of the cattle can be controlled year round. He actually visited the farms in Ft. Morgan, CO to thoroughly research and find the best of the best, and he sure did. Cline’s offers plenty of other options, so if red meat isn’t your thing, don’t fret! When it comes to seafood, there’s nothing like the Florida coast. There’s pink shrimp from Key West and fresh fish caught regularly. King crab from Dutch Harbor and scallops from Alaska also round out the array of protein. Between the red meat and seafood, there’s bound to be something for everyone. If not they will gladly get almost anything within 24 hours, custom and all. Cline’s Custom Meats is family run and operated. From humble beginnings, Joe and Milouda are continually focusing on the neighborhood, their family and the new shop. By walking in their doors you transport yourself to a simpler time when the most important question was “What’s for dinner?” Now proudly you can know Joe and Milouda by name, AND what’s for dinner. With such an illustrious past and promising future, this new addition to San Marco should flourish. Tagged carnivore, farm-to-table, locally owned, meat, specialty store. Bookmark the permalink. This knowing your neighbor facet reminds me of a kosher butcher shop in New London , CT. My Jewish girlfriend took me in there to pick up some lamb chop. We walk in and they are, Linda, how are you, how is so ans so and so on and She introduced me to the men behind the counter. Then, off we go. Easily 6 months later, she has me stop in to pick up something. I walk in and they are, Jerry, how are you? How’s Linda? How’s it going? !! !6 months! One meeting! You could have knocked me over with a feather! Simply an amazing group of people! So, yes, indeed, they will get to know everyone, I’m sure! Good Luck!